OLIVER “TUKU” Mtukudzi, who died at the age of 66, was a great cultural ambassador for Zimbabwe. He was a cultural icon for the southern African country. His aura and presence had a global resonance with fans around the world, yet the man remained humble and magnanimous. Oliver “Tuku” Mtukudzi with Cameron Ward (far left) a Jazz guitarist who was groomed by the late Bra Hugh Masekela. 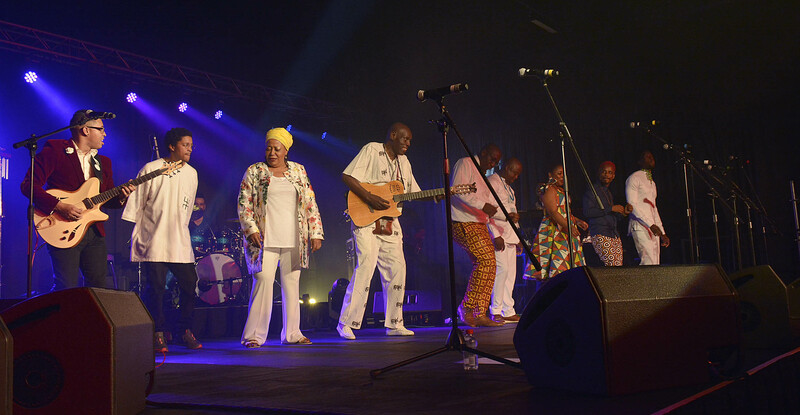 Songstress Sibongile Khumalo (white doek) also shared the stage with the late. Mtukudzi died in Harare after a long battle with diabetes, ironically enough on exactly the same day as his friend, the musician Bra Hugh Masekela, who passed away on 23 January 2018. He was also a businessperson, activist, philanthropist and a goodwill ambassador for Unicef in the southern African region. But it was his innovative music that made him deeply loved. 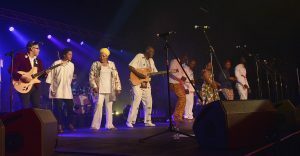 Dubbed “Tuku music”, it was a blend of southern African music traditions including mbira, mbaqanga, jit and the traditional drumming styles of the Korekore. The Zimbabwean President Emmerson Mnangagwa has declared the late Oliver Mtukudzi, one Africa’s most iconic musicians, a national hero – an award historically reserved only for the ruling party elite. He released hits such as – Into Yami (Ringo Madlingozi), Neria (Ladysmith Black Mambazo, Todii” (What shall we do?) and Hanya ‘Ga (Concern), amongst others. At the time of publishing messages of condolences were still streaming in worldwide. He was 65 at the time of his death.